Every year tens of millions of salmon return to the pristine shores of Bristol Bay in Alaska. They linger in the bay's cool shallow waters before charging up nearby streams to spawn and create another generation of wild salmon. Their thrashing silver and red presence draws an abundance of life. Bears, wolves, seals, and whales thrive on the salmon, but so do people. Bristol Bay's wild salmon support a $480-million annual commercial fishery that employs 14,000 full and part-time workers. The salmon also sustain native communities that have relied on subsistence fishing and hunting for thousands of years. But now this wild place and its great salmon nursery are under threat from the Pebble Mine, a giant gold and copper mine proposed at the headwaters of Bristol Bay. A mining conglomerate including Anglo-American, Rio Tinto, and Northern Dynasty Minerals are planning to alter the landscape on a colossal scale. The Pebble Mine would produce an estimated 10 billion tons of contaminated waste -- 3,000 pounds for every man, woman and child on Earth. Immense earthen dams, some taller than the Three Gorges Dam in China, would be constructed to hold back that waste forever. A giant pit two miles wide by 2,000 feet deep and an underground mine a mile deep would be gouged from the earth. This massive industrial activity wouldn't just destroy the ecosystem the salmon rely upon. It could hurt the fish themselves: even minute increases of copper dust in water have been shown to damage the navigational ability of salmon to return to their spawning streams. It's no wonder the Pebble Mine is opposed by nearly 80 percent of Bristol Bay residents. The growing coalition to stop this disaster-in-the-making is led by the Bristol Bay Native Corporation, Nunamta Aulukestai, and nine federally recognized tribes from around Bristol Bay. They've partnered with commercial and recreational fishermen, sportsmen and conservation groups to protect the thousands of jobs and hundreds of millions of dollars that come from Bristol Bay's renewable economic engine: wild salmon. 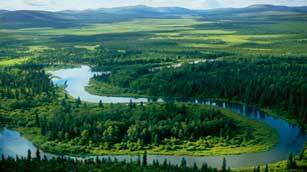 At their urging, the Environmental Protection Agency conducted a scientific assessment of the Bristol Bay watershed. The EPA's draft Watershed Assessment found that Pebble Mine would have "significant impacts" on fish populations and streams surrounding the mine site. And if a tailings dam failed and released toxic mine waste, it would have "catastrophic" effects on the ecosystem and region. The EPA has the authority under the Clean Water Act to stop Pebble Mine. The agency's draft Watershed Assessment provides more than enough information to find with absolute certainty that large-scale mining in the Bristol Bay watershed would pose enormous, irreversible harm to the watershed's natural resources -- and the people and wildlife that depend on those resources. Now is the time for the Obama administration to act. Every factor involved -- the location of the mine, the mining industry's poor environmental record, the value of the fishery that would be harmed, and the people and wildlife in the region -- suggests the risks are too high. Because once a landscape is industrialized, its wild character is lost for good. You can't recreate untouched tundra, mountain meadows, crystal clear streams, and animals that have never encountered toxic waste. We don't have many of these wild places left. We should preserve the ones we do. Actor, environmental activist, and NRDC Trustee Robert Redford is spearheading our activist campaign to Stop the Pebble Mine. You can view his new video and send your message to President Obama at www.StopPebble.com.